Accounts are to be used only by you. Account holders must not resell or give away web space or email accounts to other parties, other than the acceptance of advertisements. All web space and email accounts must remain in total control of the account holder. As far as I know it will be quite difficult to create alias e-mail accounts with a sub-domain. You need to get a TLD domain to have the e-mail setup you are hoping to get. May I suggest that when you have the dedicated domain that you use an external client like Zoho for the e-mail accounts (free plan is at the bottom of the page). Zoho allows up to 5 free external e-mail accounts with a domain. Zoho is also good with the DNS that is needed, as setting up the e-mail aliases can be a head ache with the requirements that Google asks for for reverse DNS. Zoho provides plenty of tutorials that puts you through the steps of setting up the accounts. Okay, and I am not "sharing" the account with him I am just making him a website to where at school he can use the website for people to sign a form online. Also, would I be able to change my account username to Kegan and the cpanel primary domain from skittlesdevelopment.gigapages.net to Kegan.Network? 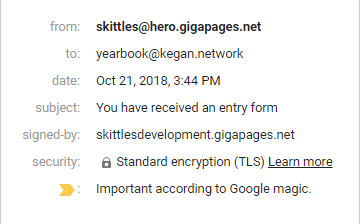 (10-23-2018, 01:01 AM)ItsSkittlesYT Wrote: Okay, and I am not "sharing" the account with him I am just making him a website to where at school he can use the website for people to sign a form online. Also, would I be able to change my account username to Kegan and the cpanel primary domain from skittlesdevelopment.gigapages.net to Kegan.Network? Thanks Skittles. Yes we can change the user name and primary domain. Before we do, can you please check there are no instances of kegan.network in your cpanel account, i.e. added on or parked. WHM/cpanel won't allow one to make a domain your primary domain if it is already in the system. I had it has an added domain which I have now removed. OK. cpanel user name has been changed to kegan and the primary domain to kegan.network. Password is the one you used, I haven't made any changes other than the user name and primary domain. If you want me to reset the password let me know. Can you check everything is OK.
(10-23-2018, 01:01 PM)Genesis Wrote: OK. cpanel user name has been changed to kegan and the primary domain to kegan.network. Password is the one you used, I haven't made any changes other than the user name and primary domain. If you want me to reset the password let me know. It looks like everything is working thank you!